Guided by our Interim Senior Minister and Social Justice Coordinator, our Ministry Teams work in a structured, supported environment to ensure that volunteers’ time, energy, and passion have a tangible impact. The focus of these teams is driven by our Unitarian Universalist Principles that urge us all to promote human dignity, equity, peace, democracy, and respect for the natural world. The FUS Equity Ministry Team exists to end racism through the work of racial justice grounded in Unitarian Universalist principles. This team offers opportunities to deepen both connections and understanding, through a range of educational, worship, volunteer and social activities. Meetings are held on the second Thursday of the month from 6:30-8:30 pm in Courtyard Room D.
Contact Sally Lehner or Jesse Dirkman for more information. 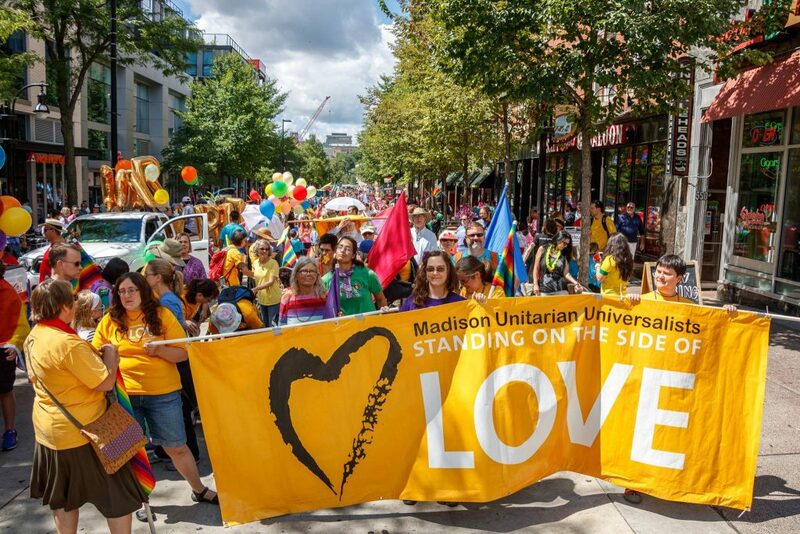 FUS belongs to Madison Organizing in Strength, Equality, and Solidarity, an interfaith, diverse organization that unites congregations to take action to reduce mass incarceration and reform the criminal justice system. Read the newsletter here. Contact Julie Loker or Alison Mix for more information. Our volunteers prepare and serve a Saturday night dinner and a Sunday morning breakfast to men at the drop-in shelter at Grace Episcopal once each month. Learn more & Sign-up here! A team of volunteers who serve at the Salvation Army Shelter for women and families. The team recruits, screens, and trains new volunteers on an ongoing basis. Repeat volunteers are always welcome. Adults only. The Sanctuary Task Force was formed to learn about the issues involved with FUS becoming a Sanctuary congregation. The group will submit a report to the Board of Trustees in May and members will vote on motions coming out of that meeting in June. Read more about the Sanctuary Task Force. You can also check out the UUA’s Toolkit for Congregations.